Mayor Murdered By Terrible Tricycle! The Sacramento, California, race lasted five years, 1999 – 2003. The Chamber of Commerce tried to raise money with it, but as we all know.... But it was a terrific race in a wonderful setting – right downtown, in and around the Old Town historic and museum district, packed with tourists. Beach, river, lawns. And it was the first KSR I heard of. When I saw the newspaper article announcing the race, I knew instantly that this was for me. The first year I went as a Glorious Spectator, strictly to observe. I deliberately left my camera at home, so I would not be distracted by the “need” to fiddle with that. I wanted to OBSERVE. And of course, I went home and started planning. 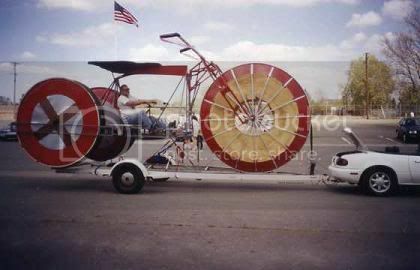 In 2001 The Two Ton Tricycle finally appeared at the race. It never turned out to look like a space ship, but it sure looked like a kid’s tricycle, so that settled that! I had worked on it long nights, and the morning of the race I had had an hour of two of sleep. My team mates showed up with the sun, and I was still welding steel one hour before the race was supposed to start. The last pieces to go on were the brakes – essentially an automobile hydraulic brake system. I poured fluid in it and figured we could bleed the system once we were checked in. We arrived just a few minutes before the race was supposed to start. The Mayor was there smiling, and a big bongo-drum band was thundering. Guess what? The brake system had bled itself bouncing down the road on the trailer. Thank you, Sir Isaac Newton, for Gravity! But guess what else? We had to prove that it worked. Up a little hill, turn around, roll down and stop at the bottom. And at the bottom was… Everybody. The Starting Line with 20-plus entries, the bongo-drum band, the Glorious Spectators. And Her Honor, the Mayor of Sacramento – a real cutie. 20-plus entries in front of me. Bongo-drum band on the right. Glorious Spectators on the left. I figured the Glorious Spectators were the softest. They jumped out of the way remarkably painlessly – as if they had had reason to anticipate such an emergency. The organizers asked us to take the start anyway, for the crowd and cameras. We made it 50 feet before the chains all turned into bird nests. The organizers asked us to trailer Two Ton to the Finish Line for static display. Rock bands played. Crowds danced. Food. Beverages. And we won People’s Choice. For traveling 50 feet. At the end of the day, Her Honor – still very much alive and cute – thanked us for participating in a wondermussly festive event. 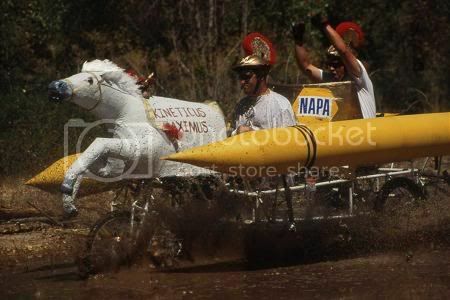 Other racers told us it always takes three years to get the bugs out, and we were well ahead of the curve. The leverage of the eight-inch brake rotor was, of course, no match for the leverage of the six-foot wheel. I’ve been using brakes that rub directly on the tire, like a horse drawn wagon, ever since. A stick on a pivot. Works great. The Two Ton Tricycle was large. That’s a Mazda Miata I’m towing with. Did that only once, and largely on a lark. 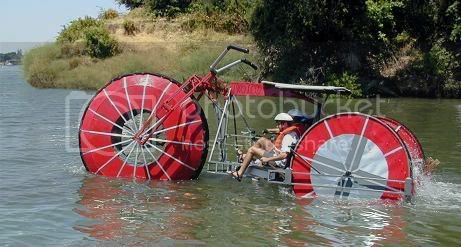 Two Ton Tricycle in the Sacramento River, 2002. Two Ton also raced at Ventura, and in the Grand Championship. I still have the eight foot front wheel. Re: Mayor Murdered By Terrible Tricycle! Yes, planning is recommended. Some builders make detailed drawings to exact scale with precise measurements. Me... I tend to design it in my mind -- with occasional notes and sketches to jog my memory as the project progresses. Finally I lay the materials out on the floor and throw sparks at them until the silly thing is ready to ride. However you go about it, you will enjoy doing it, and countless others will enjoy it with you at the races!